I've just bought the Roberts Stream WM202 radio as a gift for Christmas. I picked it because it has FM/DAB and Internet Radio, and because it had support for the BBC Listen Again. 9/10 The Roberts Stream WM202 is an excellent product, which surpasses the features of the Reciva Radios and the Freecom MusicPal. Excellent sound, easy to use menus, brilliant compatibility. I have a few Reciva based radios, and believed that their chipset and software was the only way of listening to Listen Again services without having a PC turned on. Well, I was wrong - the Roberts Stream WM202 uses the Frontier Silicon chipset, which beautifully integrates DAB, FM, Media Player and WiFi. 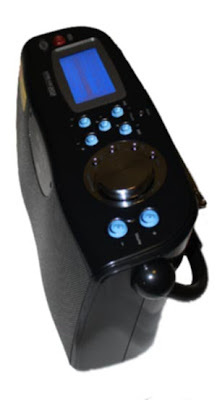 The radio is a portable stereo radio, which has a good solid construction, with the controls on the top, two speakers in the front which have an excellent output in both volume and frequency response. The display is a large multi-line graphical back-lit LCD display, with white text on a blue background. The controls are easy to use, with 5 preset buttons (which double as play/fast forward/rewind/pause when operating as a media player). There is a large rotary control which is used for selection and navigation through the menus. There are 5 preset buttons on the top, which are set by holding the appropriate button down for 5 seconds when the station is playing. 5 presets are possible in each of the 5 radio modes, which gives 15 channels in total. The radio has a 9V input, and comes with a small transformer, moulded into the plug. The radio also has a battery compartment for cable-free operation!. The radio can operate on a network either wired, or wireless (on the rear of the radio, there is an ethernet socket). The rear of the radio has a USB socket, which is provided so that the radio can be upgraded, although for most upgrades, you will not even need this, as you can upgrade over-the-air!. 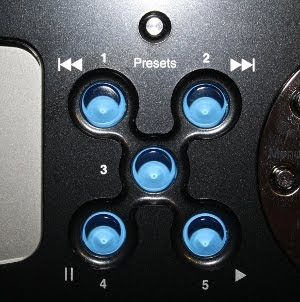 Also on the rear of the radio, there are two 3.5mm sockets, one for audio-in, and one for audio-out / headphones. When DAB is selected, the radio automatically plays the last DAB station listened to. The menu button enables you to easily scan for stations, and if you really need to do a manual scan, that is supported too. The DAB function even supports the Dynamic Range (DRC) control too. By simply pressing the mode button, the radio switches to FM mode, and starts playing the last station listened to. The controls and display for the FM mode seamlessly integrate into the radio's other features. Radio station scanning is a simple as pressing the select button - you can then store your favorites by holding the appropriate favorite button in for 5 seconds. The scanning can be configured to detect strong stations only, or stop at some of the weaker stations. Plus if the station you really enjoy is weak, you can enable 'Listen in Mono', which improves the signal quality further. With another press of the mode button, you flip into the internet radio mode. Configuration of the wifi connection is simple to do with the built-in 'Network Wizard', and you can connect to either a wired or a wireless system, and with wireless. WEP, WMA, DHCP and manual configuration are all supported. Each connection is stored as a separate network profile, so if you take the radio on the move, perhaps between houses / networks, you won't keep having to re-enter your network settings. 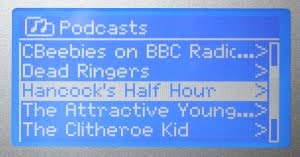 When listening to a station, be it Favorite, BBC, Podcast etc..., you can assign it to a favorite, by pressing and holding the desired preset button for 5 seconds. Currently, it is not possible to fast forward and rewind BBC Podcasts. Any access to the list of stations is performed by connecting to the internet, and obtaining the latest update. This is remarkably quick, in comparison to the Reciva browsing, with menu lists coming up within a second of the button being pressed (my Reciva based IRMA1 takes 20 seconds to bring up 'My Stations'). Now, if you want to add more than the five allowed presets, you can do in by configuring your own internet radio lists online. All you need to do is register your radio by finding your radio's unique ID number from the radio's Help menu, and creating an account on www.wifiradio-frontier.com. Here, you can browse the list or radio stations organised by country, and by genre. When you select to add the station, you can create your own groups, so that like grouped stations remain together. This becomes available on your radio immediately. Each time you register the radio, the unique ID number is re-generated, so if you buy the radio second hand, there's no need to worry when it comes to registering it - just create a new account and enter the unique ID. You can then unshare the radio settings with the previous owner on the website. If the station you want doesn't exist in the database, you can add it yourself in the 'My Added Stations' menus. With yet another press of the Mode button, you can play music from computers on your local network. With a click of the select button, I can play music from my UPNP Freecom FSG3 Network Access Storage box, which is running the Twonky Media Server. You can also play music from Windows File Shares from a networked drive, or from the Media Share option in Windows Media Player. You can also plug the headphone socket of your MP3 player to the line-in socket on the back of the Roberts Stream WM202 radio to use the radio as an amplified speaker! 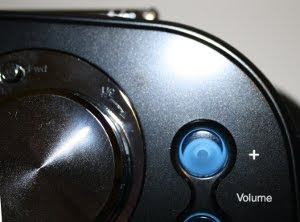 This external 3.5mm stereo jack input is mixed with the currently playing station - the manual tells you to turn the volume down on the radio, and use your Ipod volume control - I prefer to switch the radio mode to Media Player (and not browse the network to play any files). The radio has a built-in alarm clock with a snooze feature. You have two alarms which you can set to go off Daily, Once, Weekdays or Weekends. Each alarm can be set for Buzzer, Internet, DAB or FM, and can automatically switch to the last station listened to, or one of your presets - each alarm can have its own volume setting. When the alarm goes off, just hit the big round select/snooze button to get another 5 minutes sleep. If the radio station is not available when the alarm is due to sound (e.g. intenet connection is currently down), you don't need to worry about over-sleeping, as the Buzzer will automatically sound instead. When compared with the Reciva radios that I have (IR100, IRMA1 and Tevion), the WM202 is significantly better, as the features are seamlessly integrated, and the radio is much more responsive. The Roberts Stream WMA202 is also portable, which means that I wouldn't have had to have as many radios scattered around the house! When compared to the Freecom MusicPal (which uses the VTuner database), the WM202 appears more reliable when connecting to the internet, the sound output is better (and stereo!). The Roberts Stream WM202 is capable of connecting the the BBC Listen Again service, which is not supported through the US VTuner system. I was involved in setting up a project to provide alternative firmware for the Reciva radios, because they didn't do what I wanted. I don't feel the need to do anything of the sort on this radio as it is well integrated and functional.